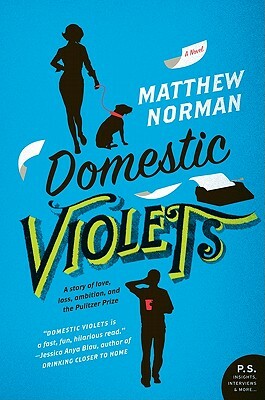 Inthe tradition of Jonathan Tropper and Tom Perrotta comes Matthew Norman's Domestic Violets—adarkly comic family drama about one man’s improbable trials of love, loss, andambition; of attraction, impotence, and infidelity; and of mid-life malaise,poorly-planned revenge, and the Pulitzer Prize for Fiction. Matthew Norman is an advertising copywriter. He lives with his wife and daughter in Baltimore. Domestic Violets is his first novel. The book begins with a detailed look at Tom and Anna’s failings in the bedroom. How did you react to this, and what function does this serve in the novel as a whole? Throughout the book, Tom spends a lot of time talking about the trappings of being the son of a famous writer. Ultimately though, has having Curtis as a father helped or hindered him? How so? Tom’s mom, Maryanne, says, “A family can only support one writer. It’s as simple as that?” What does she mean by this? Is she right? Technically speaking, the Violets are a broken family. But are they ultimately a loving one? Discuss Curtis and Maryanne. They never appear together in the novel, but their relationship is crucial to its resolution. What’s your reaction to this? Discuss the role of parenting in the book. Which characters are “good” and “bad” parents? There are many pop culture references in Domestic Violets. What do they reveal about the characters in the book? Discuss Tom’s feelings for Katie. Are they genuine, or does she simply represent something that Tom knows he’ll never have again? How does this compare to Curtis’ feelings for the many women in his life? Domestic Violets takes aim at Corporate America, the publishing industry, and, to a lesser extent, academia. Which of the three comes off worse in the novel? And, is the author’s criticism fair? Tom’s arch nemesis, Gregory, is a constant source of angst in Tom’s life. Does Gregory really hate Tom as much as Tom thinks he does? Have you ever had a nemesis—real or imagined? There are a lot of secrets in Tom and Anna’s relationship, and even in the end, much is left unsaid. How do these secrets affect Tom and Anna’s marriage, and how do secrets affect relationships in general? How much do you think Anna knows about Katie? What’s your reaction to the end of the story? Is it believable? Is it satisfying? If you were Tom, would you have done what he did? What if you were Curtis?